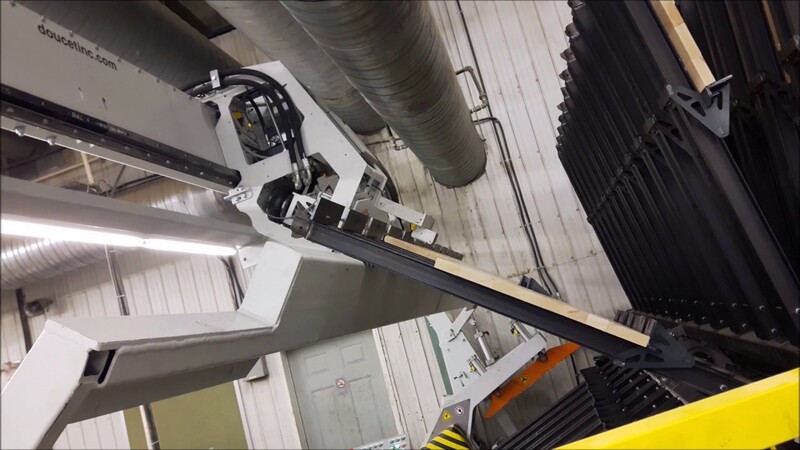 The Twin Robotic Operator RLT100 is made for tightening and loosening high volume of glued panels. The TWIN ROBOTIC OPERATOR - model RLT100 is the new generation of clamp carrier for high volume applications. The RLT100 will allow you to boost the productivity of your panel assembly operations of at least 30% while keeping your labor costs under control as operator tasks are limited to loading and unloading panels into the carrier. The RLT100 features a first ground level moving carriage with a double pneumatic cylinder flattener that flattens the panels with strength of 800 lb @ 80 psi and tightens panels while a second carriage is automatically loosening clamps holding panels in the section above the carrier's workstation. Quick and accurate movement of the carriages is made possible by a powered rack and pinion linear rail. It includes the most advanced design features for precision assembly, flawless task execution and utmost dependability. The RLT100's untightening device can have in option a laser sensor to open the clamps for the next required panel width. The clamp carrier SRX in combination with RLT100 can be provided with 8" wide jaw clamps at fixed position. This feature increases the productivity of the operation between 15% and 20% by removing the non-value-added tasks of the operators to move clamps between panel length changes. The 8" wide jaw clamp is the type of clamp mandatory to implement the Automatic Loader for Clamp Carrier (ALYX), even if made in a different phase.